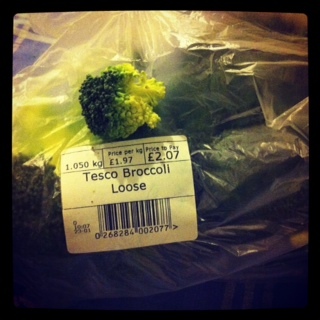 This week I discovered that 1 kg of broccoli is not the same as 1 head of broccoli. If you were shopping in the supermarket you would know this, but with online shopping it’s hard to tell. Even though you only have to count up to one, there’s still the potential for it all to go horribly wrong. Anybody want a tiny tree? January 29, 2012. Tags: broccoli, online shopping, shopping. Rants, Top Tips. January 30, 2012 at 9:40 am. Permalink. Online grocery shopping is to be avoided at all costs. We had to cancel the home deliveries after I started getting a tad too excited about the whole thing and found myself waiting my the window up to two hours before the delivery was due. Anyone would think it was Father Christmas making a delivery and not just the bloke from Sainsburys. January 30, 2012 at 6:58 pm. Permalink. I love online grocery shopping. I don’t want to go to an actual supermarket and walk around it with a trolley and have to go back for something that I didn’t see the first time around and try not to crash into other people and then queue up and pay and put it in bags and put the bags in the car and put the trolley back in the trolley place and drive home and take it out of the car… I want to sit with a cup of tea and be able to see a special offer on pasta and think “do we have plenty of pasta, or is there room for more pasta in our lives?” and just go look in the cupboard. February 1, 2012 at 7:00 pm. Permalink. @lunchboxworld Yes I made some soup and the children cried and refused to eat it. @Mothersalwaysright – don’t go for Abel & Cole, that really will get you excited. They bring it in a nice cardboard box tied with string. February 1, 2012 at 9:09 pm. Permalink.